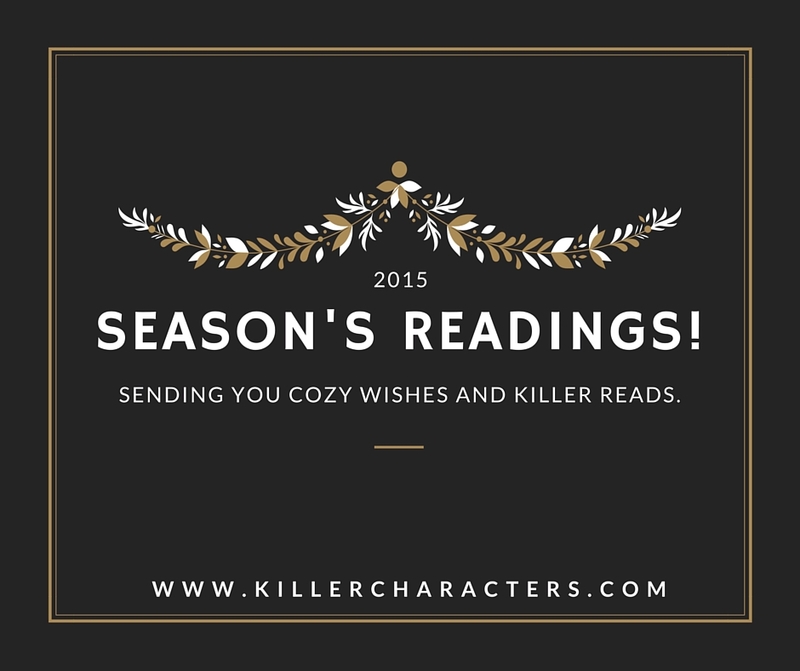 Killer Characters: Never Too Busy for You! It's a hectic, crazy (but fun) time of year for all of us here in Tallulah Falls! I'm making last-minute Christmas ornaments and gift tie-ons. Sadie and Blake are baking extra goodies to meet their customers' demands. Vera is helping Paul find delightfully heartwarming stories for a special holiday edition of the newspaper. And Ted is heading up a charity toy drive. What about Angus, you ask? He's as laid back as ever. He sits by the window waiting to see if Veronica will bring Clover by or if Todd might drop in with a treat. 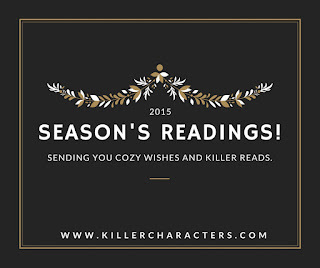 But all of us want to take a moment to wish you, our wonderful readers, the happiest of holiday seasons! Amanda Lee is giving away three copies of The Stitching Hour. U.S. readers will receive a signed paperback copy of the book, and international readers will receive a digital copy. To enter the giveaway, please leave a comment with your email address and whether you're a U.S. or international reader. Or, if you'd prefer, you may request an ebook rather than a paperback no matter where you live. Winners will be chosen on Monday, December 14, 2015. Good luck! Busy here too, but I do love Christmas!! Merry Christmas and Happy Holidays! Thank you for the wonderful giveaway. I am still working on getting everything ready for Christmas but it is a slow process. Happy Holidays to all! 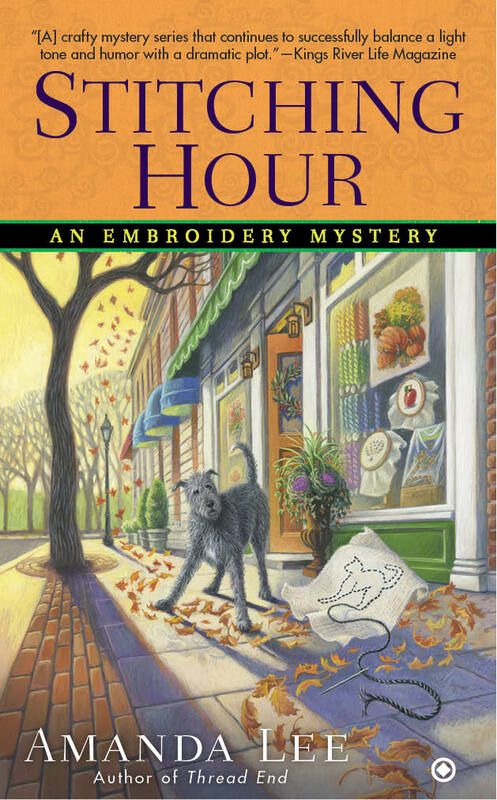 I would love to read The Stitching Hour—thanks for the chance to win a copy! I'm a U.S. reader and would prefer a print copy, if I'm lucky enough to be chosen a winner! Yes busy here too, but would love to put my feet up and read this book! Merry Christmas! Finally feels like Christmas time in California... Rain, wind and hail last night. Would love an ebook copy of this book. Such a good series. Excited to read this one. Happy Holidays to all! I'd prefer a print copy and I'm in the U.S. Happy Holidays and thanks for all the great giveaways. I wish I could be laid back like Angus but I'm still way behind. Thank you for the chance to win. What a lovely holiday gift. Print book please. ksarginson@tampabay.rr.com USA. What a great Christmas present this would be. This is on my list to read. Would love a paperback copy. Still like reading a real book most of the time. Merry Christmas. I've started this series and am loving it. I have a little catching up to do and am looking forward to it. I would love to win the paperback and yes I'm in the U.S. Merry Christmas! I proper print copy would be lovely. I'm still wrapping and getting my Christmas cards ready. At least the outside is decorated and the Christmas tree is up and lit! Love this series! US - print copy. Doesn't feel like Christmas - no snow in MN - not in the mood yet! Where I am it looks like the cover of the book. Not that I am complaining, the weather is beautiful. Happy holidays, and thanks for the chance to win! Merry Christmas! I would like a print copy, I live in the U.S. Thanks for the chance. Joy to the World! Thanks for this chance to win one of your books! Hi from Linda in northern CA! I would love to win a paperback book!!! Thanks for the chance!! lindaherold999@gmail.com Happy Holidays to the authors at this great site!! I would love to win this book and thanks for the giveaway opportunity. Happy Fun Holidays! US & paperback please. Thanks for the giveaway! Happy holidays to all. Amost up to speed. Need to put up our tree yet. Have grandbabies coming for Christmas. Thanks for this opportunity. I absolutely love this series! I live in the US and would love to read this book. Merry Christmas!! I would love to win this one. It sounds really great, I'm in the US. I love this series, and I love that it's set in Oregon. Sounds like a great read. Merry Christmas! I'm in the US. US reader. Love the title! thanks for the book giveaways . I would like a paperback book and USA all the way. Merry Christmas, thanks for a chance to win. I'm in the US. With some many cozy mysteries to choose from, I get stuck standing in front of the shelves at the bookstore trying to decide what to buy these days. Thanks for the giveaway & Merry Christmas! Ooh sounds great. Can't wait to read. I'm in the U.S. And would love an ebook. gaeagon@gmail.com. Merry Christmas. Season's Greetings, sounds like a delightfully hectic time, but I'm with Angus, I'd rather stay laid back and wait for a treat, lol.